As you may know, I’ve been working on Kate’s new cottage inspired bedroom. That means tons of little home-made details. This week, I’ve been working on her bedding and curtains, and decided to make some throw pillows. 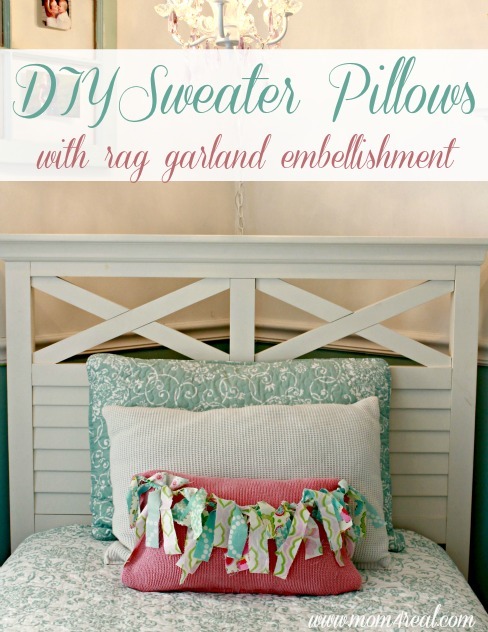 These aren’t just your run of the mill throw pillows, though…these are DIY sweater pillows! Yep…pillows made from my old sweaters. My friend Jill from Create.Craft.Love recently made some, so I decided to try and make some as well. You can check out her tutorial for the actual pillow making instructions. I wanted to take the pink pillow a step further and add some embellishments. I pulled out some of my scrap fabric and got to work. I simply cut strips of fabric, tied them onto some bakers twine and sewed each end to the pillow. Isn’t that little rag garland adorable and extremely cottagy? I also used one of my white sweaters that had a small hole in it to make a creamy white pillow too. Kate has been dragging this one around all over our home…she says it’s the most comfy pillow ever…now how sweet is that? I’m using the same rag garland as part of her window treatment, but you will have to come back next week to see that! Wanna see a little more of Kate’s room? You can check out a sneak peak of her room here and also the aqua painted dresser with ribbon pulls that I rescued from the side of the road. I can’t wait to show you the rest!!! 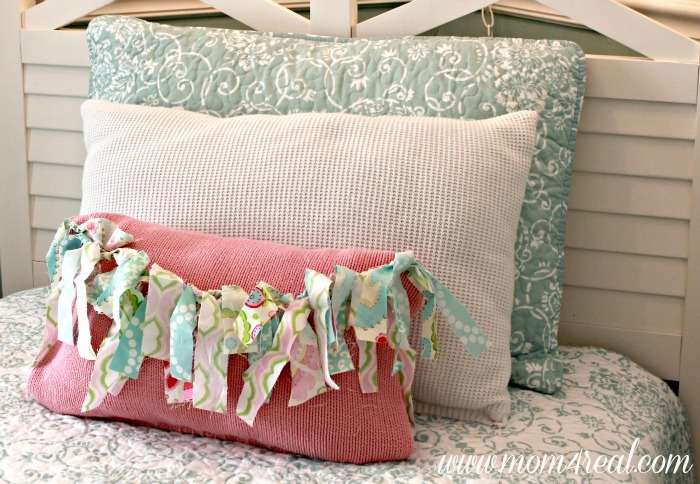 Awww…I love the little rag garland! Can’t wait to see the windows! So sweet! It’s looking amazing! 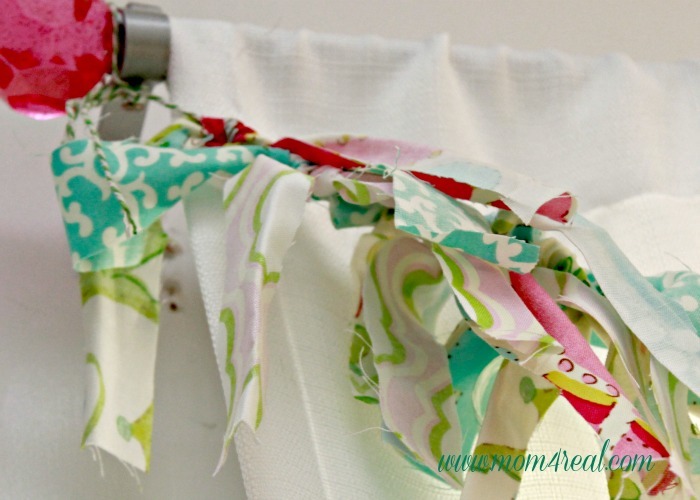 That fabric garland is da bomb… I lurrrrve it! Your pillows are fabulous! These will grow with her I can imagine these in a college dorm room – LOVE! What? No! As soon as I started reading this post I was all “Oh yeah! I love rag garlands! I should make more! You know where they would look cute? As part of a window treatment!” And then I get to the bottom of your post and you’re all “I’m so smart. I’m going to think of the idea to put rag garlands on windows way before Courtenay and then I’m going to say it so she’ll just be a big ol’ copy cat.” Yeah, that’s what happened! ummm… CUTE!! I can’t wait to see the reveal – I know it’s coming together so beautifully! Ooo, I’m so looking forward to the big reveal! Love this! What a lucky girl! I do love the cottage theme for a bedroom. I would love it if you linked this project at Thrifty to Nifty Thursdays at A Jennuine Life – http://www.ajennuinelife.com/2013/03/thrifty-to-nifty-thursdays-10.html. That little pillow is the perfect touch! I love the scrap swag that you used on it. Great idea! I love you you embellished the pillow with the fabric rag garland. Too cute! 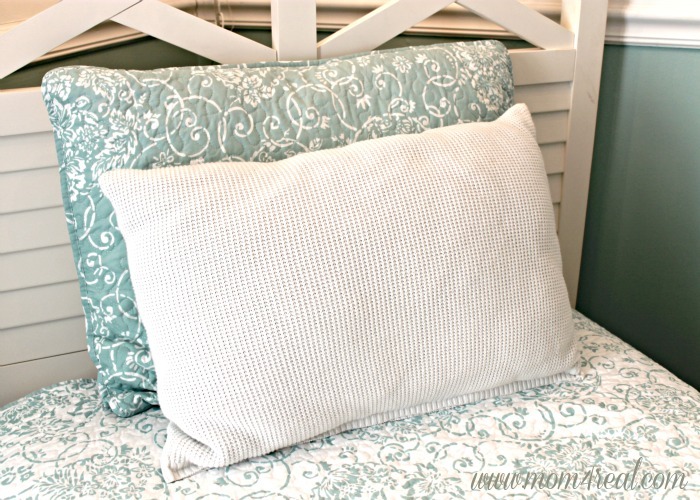 Great looking pillows -love the scrap banner! Your pillows are so cute! The window treatments look like they’re going to be adorable as well. I love it! It gives the pillow so much detail and fun! Love the idea for the window treatments too! I love this – and would love to feature it on my blog next Tuesday in my weekly DIY post, if you don`t mind! 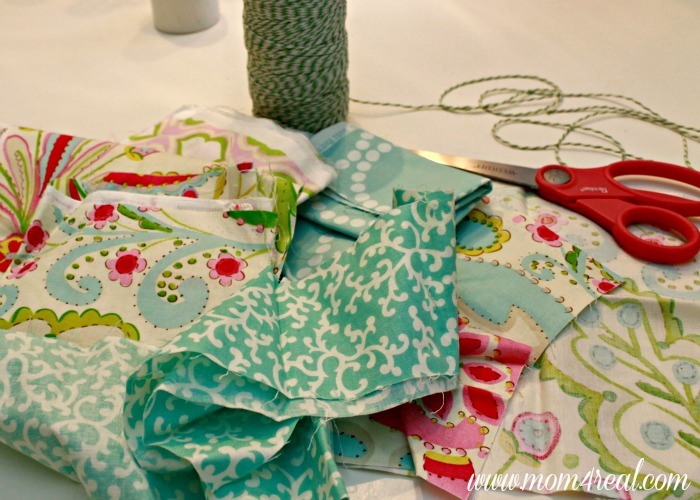 It looks great and I love the fabrics you choose!